Finding Eagle's is easy: it's one of the most recognizable landmarks in West Yellowstone. 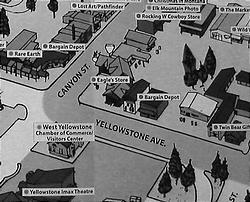 Eagle's Store is conveniently located just outside of the West Gate of Yellowstone Park, on the intersection of Canyon St. and Yellowstone Ave.. If you are coming from the Park, it will be on your right-hand side just as you arrive in West Yellowstone. If you are coming from 191, follow Canyon through West Yellowstone to Yellowstone Ave, where you will see Eagle's easily on your left-hand side. Those arriving from 20 will take a right onto Canyon and do the same thing. Parking is usually available on Canyon St. or next to Eagle's through the Canyon St. entrance.